The Greek Evangelical Church originates spiritually from the Apostolic Church that Jesus Christ Himself founded and historically from the Reformation of the 16th century. Our faith is summarized in the words of the Nicene Creed (Nice/Constantinople). The Purpose of our Church is to worship our wonderful Lord, to teach the Word of God and lead the lost and sinning person to Jesus Christ. 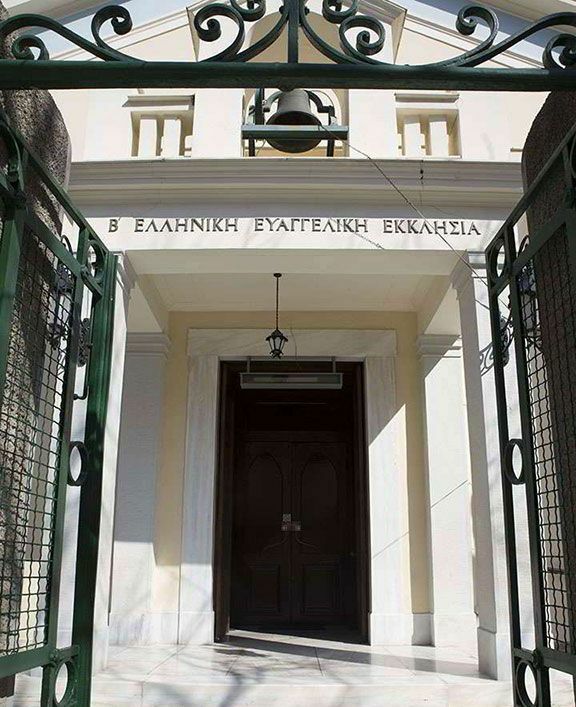 The Second Greek Evangelical Church of Athens was founded in 1924 by refugees who were forced to leave their homes after the Asia Minor Disaster in 1922. Also there are other meeting groups for youth, men, women, couples and home meetings for Bible studies and christian company. “Symparastasi” is the name given to our philanthropic activities. All the activities are supported by members and friends of the community of the Church on a voluntary basis. For the past two years, free meals are offered every week to approximately 250 needy people around us. Thus, meals are offered every Monday and Thursday, freshly cooked in the kitchen of our church. We supply a number of families with basic food supply every month. This effort, at this stage, is aimed at people who mainly live in Koukaki, and is performed exclusively by volunteers who offer their time, effort and donations. The Church operates a multi-purpose Community Center. The ground floor, called “Sfina” is used for the weekly meetings of teenagers and young people of the Church and neighborhood. The basement, called “Steki” operates as a multi-purpose space for philanthropic efforts. Sunday School is aimed at preschool and school-age children up to High school seniors. The youth Group of the Church is for young people who want to have a time during the week to gather for spiritual fellowship and prayer. Young people and teenagers of the Church organize games in the nearby playground, such as basketball and volleyball for the children of the neighborhood and other games for younger children. Vacation Bible School is held every June (the first full week after the closing of schools) and is for elementary school children. We invite you all in another one of our “Evanggelical history nights” in 26th March. The subject is the life and offering of the elder Charalampos Sidiropoulos. Speech-Presentation: Yiannis Tsevas.